Continue my thoughts about 3DEXPERIENCE platform and Dassault Systemes strategy related to organization transformation, I was reading CIMdata – Dassault Systèmes 2017 Analyst Event (Commentary). Navigate here to read the article. It was published just few months ago and it gives few interesting data points about how Dassault Systemes see the future of 3DEXPERIENCE platform. This next phase in realizing their strategy encourages companies to select Dassault Systèmes’ 3DEXPERIENCE platform as the platform of choice, without needing to worry about how to deal with their legacy solutions, as they can readily be integrated. For example, the marketplace will allow customers to identify potential partners to help them manufacture parts based on their requirements, initially focusing on 3D printed parts. This adds an extra dimension to enabling collaboration across the value chain, which lies at the core of PLM, and puts Dassault Systèmes right in the center of it. CIMdata applauds Dassault Systèmes’ initiative to evolve the 3DEXPERIENCE platform in this direction. The platform’s ability to integrate and enable both native solutions and third-party solutions is critical to its long-term ability to enable an enterprise’s product innovation platform. I found similar messages listening to sessions and presentations from recent Dassault System North America Forum 2017. Navigate here to learn more. 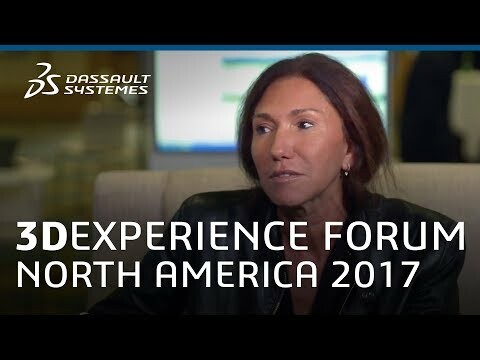 The following video is presenting Dassault Sysemes Chief Strategy Officer Monica Menghini speaking about 3DEXPERIENCE. Watch this video. She speaks about future of value chain and B2B platform integration, alignment of supply chain and expanding it beyond traditional horizons of business systems. In a nutshell, value network is the next level of supply chain connecting data, processes and organizations. Highly powerful and sophisticated vision. Here is the thing. How to connect the dots of 3DEXPERIENCE implementation complexity I was discussion yesterday together with the vision of creating another level of system (experience) to absorb legacy solutions and databases? The approach isn’t entirely new and the idea to create an overlay was used by B2B companies long time ago. Remember EAI (enterprise application integration), BPM (business process management), Enterprise search, Portals and many others. It doesn’t matter how to call it, but the question what technologies can be used to create this overlay and what will be the cost of additional IT infrastructure vs value it brings to businesses.